Hello, all! It’s time for another review and giveaway. This time it is for the Total Uninstall Pro and this is TechnoGiants 7th giveaway and TechnoGiants would like to give our valuable readers the genuine license of Total Uninstall Pro 6.3.1 worth $39.95, 5 lucky winners will get 1 license key each, so read the review, give your comment and participate in giveaway. 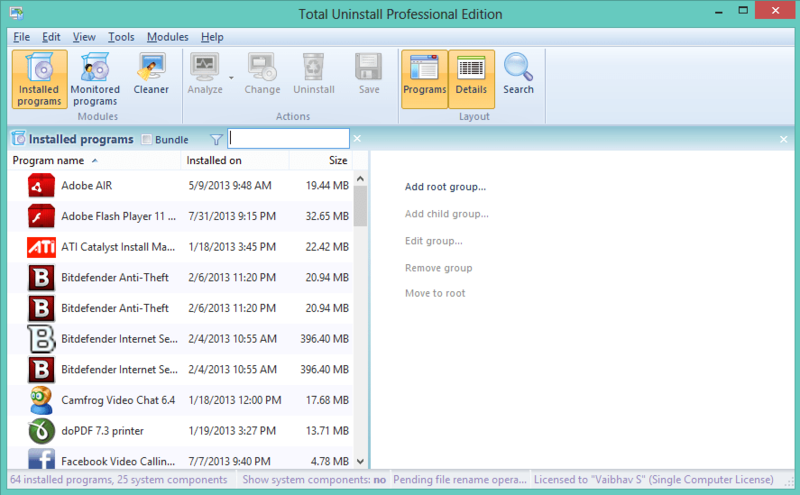 Totally Uninstaller has a basically 3 modules such as Installed Programs, Monitored Programs, and Cleaner. Total Uninstall provides three analysis profiles i.e. Safe, Normal, and Advanced to scan left over items. You can choose any profile while Scanning for leftovers. Safe profile produces less False positives and Advanced Profile scan extensively for leftovers and may produce False positives. You can even edit these profiles or create a new one with your own parameters. Installed Programs module analyze existing installations and create a log with installation changes. It can uninstall programs even without the help of the supplied Add Remove program. Select the Bundle check box if you are going to uninstalling more than one program at a time. You can review the details and remove some of the detected items. Select the program from the list which you want to uninstall and in a few seconds Total Uninstall will analyze it and will show in a tree view detected Files, Folders, Registry Keys, and Values of that program. Total Uninstall has a Search facility that can be used instead of having to manually search through a large number of programs installed. Different analysis levels can be tried to get the best results. Cleaner module can scan the system and find the traces left behind by uninstalled programs. 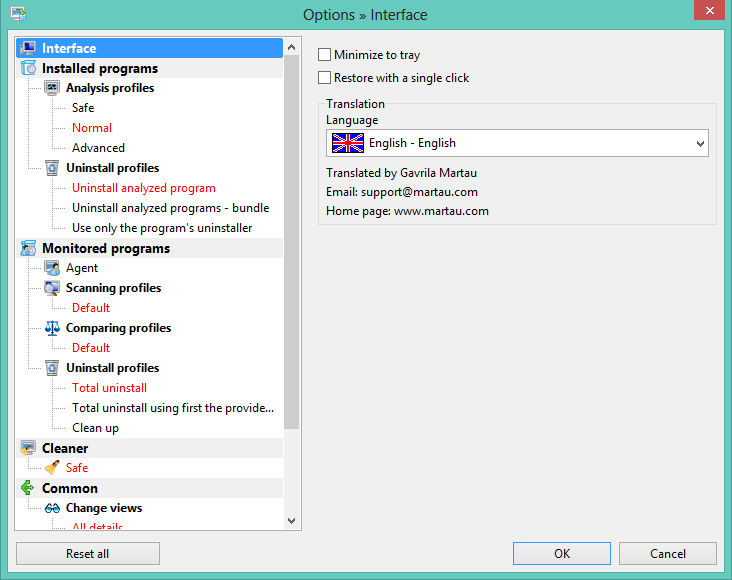 Inside the Option interface, you can select any of the profile for Analysis as well as Uninstall. You can tweak Monitored Programs options, dig with Cleaner, change the view, and change update mode. You can also be able to change the language and if you check the check boxes then you can make Total uninstall to minimize to tray and you can restore system in a single click. Total Uninstall off course is a better alternative to windows Add or Remove Program and it does the job accurately. It uninstalls the software completely from the system leaving your system clean from leftover junks. 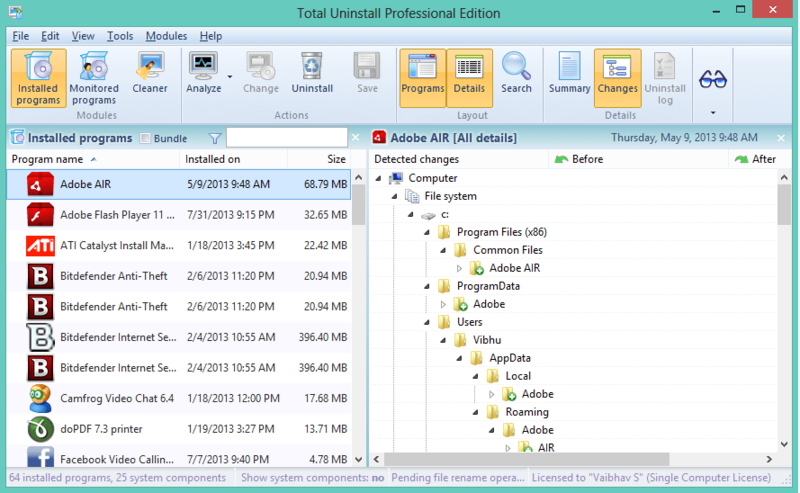 Below is the way to download Total Uninstall Professional Edition. You can try the software for 30 days and buy a key after that and if you will win a key from us then you can use that key to activate your version. I would like to say Thanks to Gavrila Martau for giving me a chance to offer a Giveaway to TechnoGiants readers. 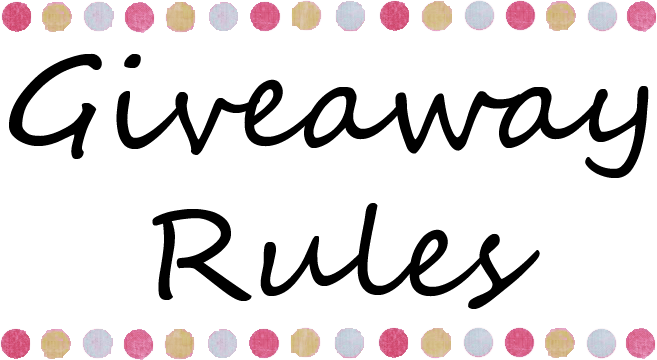 You can win 1-year subscription of Total Uninstall Professional by entering the giveaway and you need to follow the below rules to participate in this giveaway. Disclaimer: I received a copy of the Total Uninstall Professional in order to facilitate my review. Opinions expressed are 100% my own and have not been influenced in any way. Drupal 8: What’s in it for me? Very professional and one of the best uninstaller. Thanks for stopping by and joining the giveaway. Thanks Rodney for enjoying your visit on TechnoGiants. I hope you will win the key. It is one of the best uninstall tool to date. It completely cleans your system after uninstall. i think Total Uninstall Professional is very powerful and useful to remove totally. Great Software and Giveaway also. Total Uninstall is one of the best software to monitor an installation and detect all the changes have been made. Thanks a lot for Total Uninstall Professional giveaway. It is the best software available to uninstall stuffs. TU is my fever. Thankd for giveaway. I like the total uninstall.Its good for the pc and this is the best uninstaller of all. I have never had Total Uninstall Pro. I would like to give it a try. Awesome software suite. Thanks for this Giveaway ! Please count me in too ! Thanks for informing me on time. Now the PunchTab is on and you can use it now. Use the PunchTab to collect your entries.